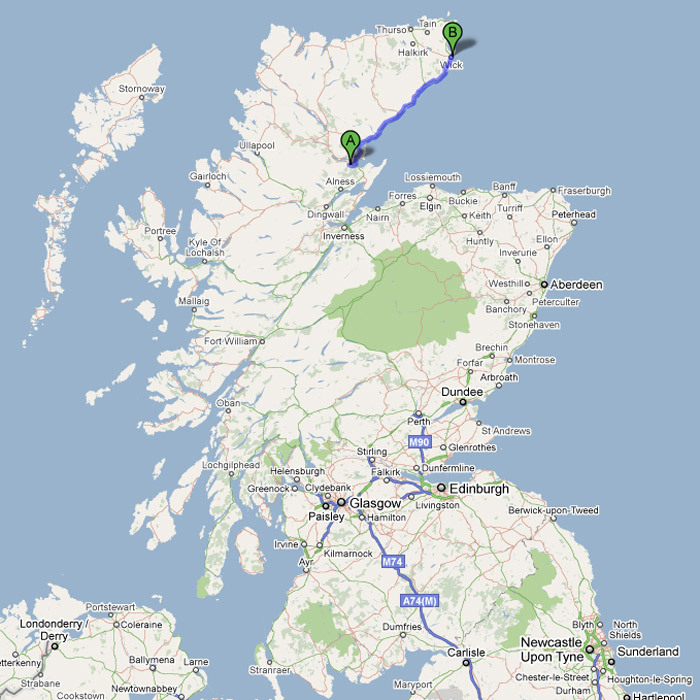 Leg 2 of my Inver House distilleries tour started off with a bit of a drive. Our departure point was Edderton, home of Balblair, and our destination was Wick, site of the Pulteney distillery. Scotland is a lot longer than you might expect (as the inhabitants pointed out when the BBC switched to a weather map with perspective, squishing the scots’ 3/8ths of the UK into a comparatively tiny sliver perched on top of an oversized England) and Wick is really far away from almost everything, sitting 35 miles from John O’Groats, the north-east end of the mainland. So, after a couple of hours of driving (well, being driven) up and down hills, and around hairpin bends while avoiding articulated lorries full of grain and tanker trucks full of new make spirit (which let us know we were going in the right direction), and with a brief slowing as we saluted Clynelish while zooming through Brora, we ended up in Wick. We were staying at Mackays hotel, on the shortest street in the world, and with an international group suffering from jetlag, early morning starts and general knackeredness we all departed to bed fairly early after dinner with Malcolm Waring, Pulteney’s manager, who’d we be seeing again bright and early the next day. Day dawned, breakfast was eaten and we went for a slightly damp walk past the harbour and up the hill to our destination – there’s nothing like a 9:30am distillery tour to get the blood flowing. Fast forward to the beginning of the 20th century and Pulteneytown officially merges with Wick in 1902. 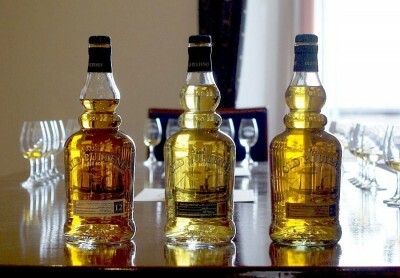 The distillery was sold to James Watson in 1920 and then sold on to Dewars in 1923. 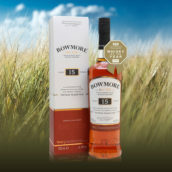 Perhaps coincidentally the year before the Dewars sale the problems due to the heavy drinking by the locals led to the town being declared dry, which was repealed in 1947. 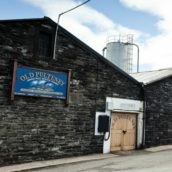 Production ceased in 1930 and the distillery fell silent until 1951, when the stills were fired up again and have continued making whisky to the present day. 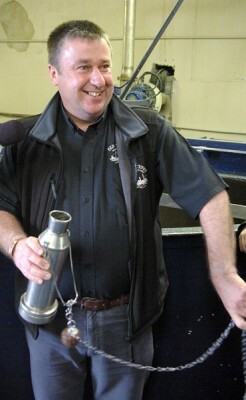 Malcolm Waring has been manager since 2006, starting work in the industry at the distillery in 1990. Apart from a 6 year turn at Knockdhu from 2000 and some relief manager work at Balblair and Balmenach in the late 90s Pulteney has been his home in the whisky world. He met us at the door, looking worryingly chipper for a man who’d gone back to work after dinner the night before, and gave us a tour round his establishment. 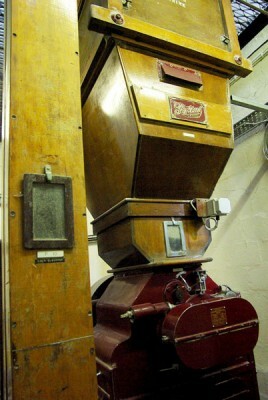 First up was the mill room, with an almost 90 year old Porteus mill (as almost every distillery seems to have – unfortunately they were so reliable that the Porteus company went out of business, as noone ever bought more than one…) grinding through 5 tons of grain for each mash. They use a stainless steel semi-lauter mashtun, clad with wood to look nicer, and a fairly usual cycle, taking about 6½ to 6¾ hours per mash. 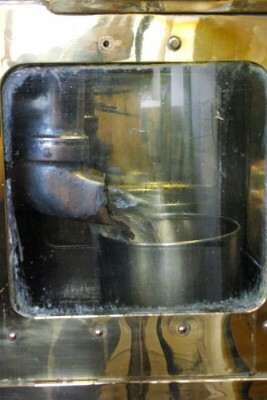 The left-over draff is mixed with the pot ales, the waste from the first distillation, and dried into animal feed – cattle cake – which is sold to local farmers to feed their livestock. None of the waste leaves the county, all being used by industry in the area. The wort is then transferred into stainless steel lined, Corten steel washbacks for a 52 hour minimum fermentation. Unlike most distilleries Pulteney uses dried yeast, as while the transport links are much better than they were in the days of the Herring Boom they still aren’t that great in winter, with snow isolating the town for days at a time. While wet yeast requires regular deliveries, as it doesn’t live forever, dry yeast has a shelf life measured in years and provided it’s handled correctly can be just as effective. The yeast they had on hand that day was a pebbly dust with a strong smell of strawberries – not what I expected at all. Like at Balblair we were offered a taste of the wash, a slightly different take on the idea of a cereal based breakfast, and it was very dry and malty. After fermentation, the wash is transferred to the stills for the regular double distillation, although the Pulteney stills are a little on the weird side, even in the world of whisky, where every distillery has their own take on still shape and size. 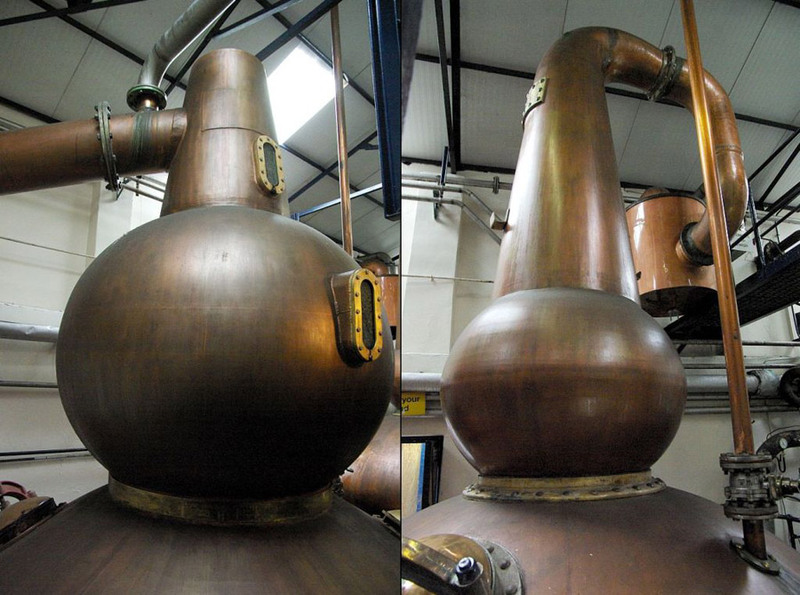 They both have massive boil bulbs, there’s an unused rectifier on the spirit still and a very strange flat top on the wash still. The latter is the most frequently mentioned, with the still looking overly strange, and the story is that when they brought the still in they hadn’t measured the height of the roof (since raised) correctly and had to chop the top of it off. Whatever the truth of the matter, all these bits contribute to the production of Pulteney’s fairly oily new make spirit. Once the spirit has been distilled and condensed (shell and tube condenser, in case you were wondering) it goes through to the filling shed, where it goes either into tankers for maturation elsewhere or into casks for ageing onsite. 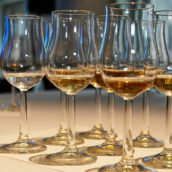 About 40% of the whisky goes elsewhere, with companies such as Chivas Brothers and Whyte & Mackay buying it as well as it being used in parent company International Beverages’s own blended whiskies. 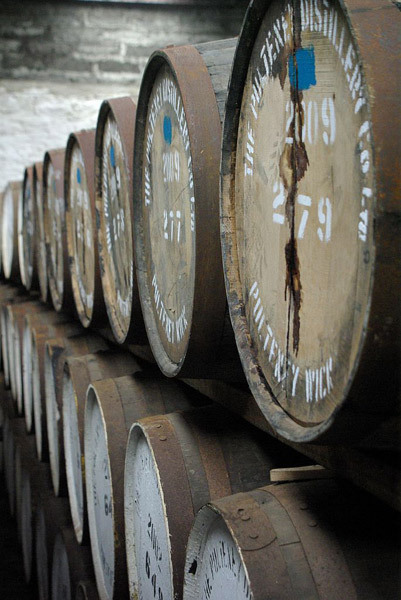 The vast majority of whisky that stays at the distillery is filled into former bourbon casks, with only about 5% going into sherry barrels. 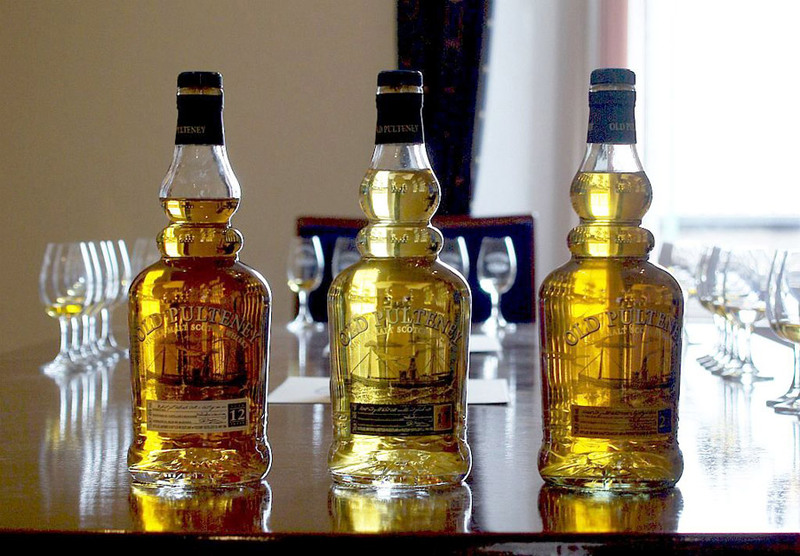 They use a range of different types of casks, giving them a wide profile of spirit to use to create their range of whiskies. We then moved on to the warehouse number 6, very different to most in the industry as it has clear panels in the ceiling meaning that it was full of natural light – it’s quite a strange thing to see maturing casks in sunlight, after years of seeing them in windowless warehouses. It’s otherwise a very traditional warehouse, with an earthen floor and casks not stacked more than three high. They have about 24,000 barrels maturing at the distillery, about 3.5 million litres of spirit, which is a lot for such a compact location. They are almost full though, currently filling casks to fill in the gaps as barrels are rolled out for bottling. Before I get on to the drinks, a word about the name. 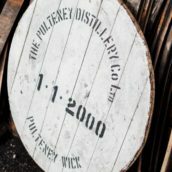 The distillery is the Pulteney distillery, but the whisky is Old Pulteney. This comes from Sir William Johnstone Pulteney MP, founder of Pulteneytown and at one point maybe the richest man in the UK. He was famed for his occasional rants in parliament and nicknamed ‘Old Pulteney’ by his peers, which ended up being co-opted by the distillery as the name for its whisky. It’s a nice story whether true or not, and William Johnstone (who changed his name to Pulteney after marrying Francis Pulteney) is an interesting chap whose Wikipedia page is worth a quick glance. Anyways, first up was Pulteney New Make Spirit, served to us at still strength of about 68%. Nose: grain, lime and brine with a touch of sulphur and leather. Taste: Medium sweet, with citrusy grains and sweet apple. Comment: The first new make spirit that I tried, back at a TWE tasting in 2010, and still one that I find dangerously drinkable even at full strength. 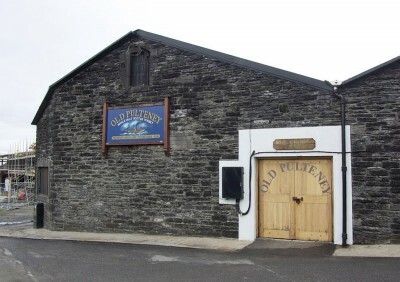 We then moved on to the first in the regular range – Old Pulteney 12 year old. This is all ex-bourbon cask whisky, mainly first fill with a little bit of 2nd fill to round things out, bottled at 40%. Taste: Very much as with the nose, with a sweet and creamy start leading to vanilla, lime and wood. There’s also a bit of nutty coconut in the mix. Finish: Dry cardboard, coconut and a bit of brine. ‘A box of coconuts gone overboard’, if you will. Comment: Probably my favourite in the range – a good chunk of salt as well as big bourbon cask flavours cut with limey citrus. Next was the Old Pulteney 17 year old, about 90% refill bourbon casks and 10% sherry bottled at 46%. The previous version of this used to have a load of first fill bourbon in, but that recipe was phased out to give something with a little less bourbon cask punch. Taste: Sugar sweetness quickly leading to dry wood, with some dried apricots and raisins. Water brings out more fresh sweet and sour fruit – plums and their stones. Comment: Quite different to the 12, richer, more refined and less ‘filthy’. Last in the regular range is the Old Pulteney 21 year old, made up of about 1/3rd fino sherry casks and 2/3rds refill bourbon, bottled at 46%. Nose: Apple, butterscotch, Malted Milk biscuits, bananas and a little bit of lime. Taste: Again a sweet start, moving on to marzipan and then sour fruit, green apple and cinnamon. There’s also vanilla, dry wood and some of the bananas from the nose. Comment: Again very different to the previous two – lighter and not quite so rich, but with more of an apple-pie-ness (that is now a word. I decree it). As a final treat we also got to have a taste of the Old Pulteney 30 year old, a limited edition bottling at 43% of ~12 casks, that is currently the oldest bottling that they produce (until their 40 year old appears later this year. Hopefully…). Nose: Flowers – maybe honeysuckle? – with their leaves. Light vanilla, toasted oats and the standard Pulteney hint of lime. Taste: Sweet vanilla cream + red apples to start. A middle of tannic hazelnut skin and polished wood. Water brings out some more sweetness in the middle, but leaves it still quite dry. Finish: Woody and long with a hint of smoke. Comment: Another different take on Pulteney, much lighter than the age would suggest, but really quite interesting. Again we ran over time, the peril of letting bloggers ask questions, and after a quick stop at the ‘fill your own bottle’ station (where we managed to find the day when the ‘fill your own’ tap was pouring whisky almost as slow as it could) we jumped into the van for the longest drive of our trip – Wick to Speyburn distillery, near Elgin on the other side of Balblair. You can see more of my pictures on our Flickr page, listen to Mark talking to Malcolm as we walked around in WhiskyCast 321 and read about about the visit (in Swedish) at WhiskyBlogg.se. Again my notes need to be written. No time. And Malcolm is an awesome bloke. No less.